Bubinga is an extremely hard material, which tends to emphasize only high frequencies which are disagreeable to the ear. 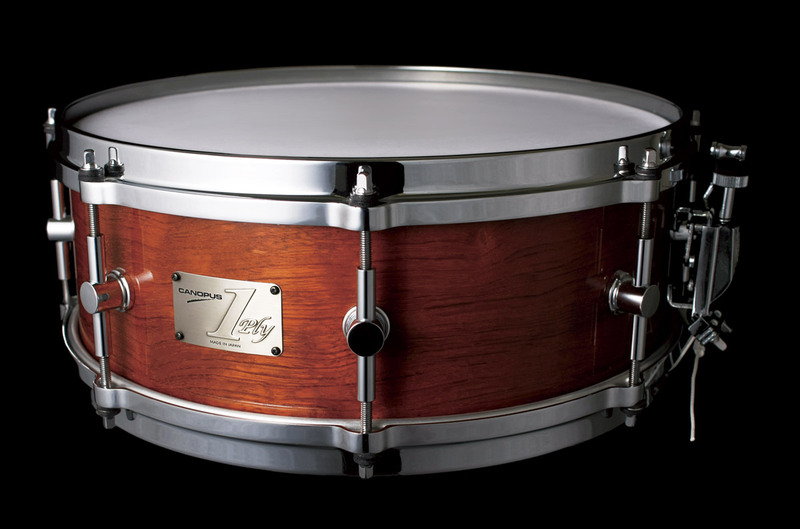 However, by applying our edge-shaping techniques on the solid Bubinga shells we were able to create a fat, pleasant sound while maintaining the high pitch range that is common to metal shells. What is distinctive about this shell is the earsplitting sound projection. When we look back on the history of snare drums we see a transition of crafting techniques. From hollowed one piece shell, to 1 ply shell, to plywood shell with reinforcement, plywood shell without reinforcement, and then block shell construction. Though this transition was in the pursuit of efficiency, each method of construction has resulted in a different sound. Through Canopus’ research into the various combinations of materials, number of plies, and reinforcement we have continued to introduce a variety of new drums. With the Zelkova snare drum Canopus has presented the ultimate sound for a one piece, hollowed shell. The notable characteristics of a 1-ply shell are a deep sound and pure tone. It has been a new challenge for Canopus to take advantage of these qualities and create new instruments displaying the diverse sound character of different wood materials.